The Whirling Dervishes Ceremony: Significance of the Prayer Dance Ritual—The Remembrance of Allah is the Greatest Force! (top) The Shrine of the Jalaluddin in Rumi, Turkey. 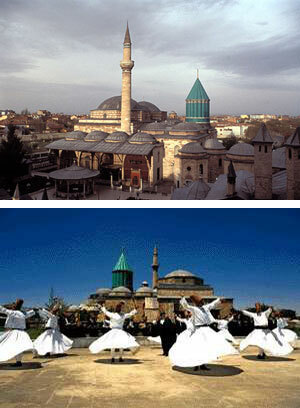 Photo courtesy, SacredSites.com (lower) The Whirling Dervish Prayer Ceremony being conducted outside of the Shrine of Mevlana Jalaluddin Rumi, in Konya, Turkey. Photo courtesy, Adnan Tuncel. According to the Divine Teachings of the Honorable Elijah Muhammad, every people and nation is welded to its own distinct cultural heritage linked through ancestral origins. Only the Black man and family members of America have lost their way to their origins because of their confinement to forced servitude slavery by the White Colonial nations of Europe. We have been viewed by the world as a mentally dead people to be used by others as merchandise for commercial barter and trade. Why has Almighty God Allah allowed this condition of gross ignorance and darkness to prevail, which lead to the Trans-Atlantic Slave Trade and subordination to the White man’s rule? The students and followers of the Honorable Elijah Muhammad have been given the real truth on the secret knowledge of the making of the White race. His very nature is inclined to conquer and to rule over the Original People of our planet, with a particular focus on the Black man of African Descent. By the very nature of the White race, they cannot help their inert tendencies toward racism and discrimination because it is inherent in the very nature of their being. It is this teaching on the truth of the races and how they came to be that has enraged our open enemies to be so violent in temperament and beastiality. They cannot be reformed unless they are taught a new way of thinking and acting, which can only come about if they submit to the nature of Islam by faith, which is the nature in which Almighty God Allah has created all humans as divine. The Honorable Elijah Muhammad further stated that in the process of the White man’s short rule and dominion on our planet, the period of the Black man’s enslavement was prompted by revenge and a desire to get even with us (the Black Original Man of Asia) for what they had to endure and experience during the period of their confinement to the caves and hillsides of Europe. The Origin of the inhabitants of modern day Turkey are considered to be members of the White race and they are related to various tribes scattered throughout Central Asia and the Caucasus Mountains. They are not the ones who were exiled into the caves and the hillsides of West Asia (Europe) today. They escaped and fled to the hills of Central Asia forming communities among the ancient tribes and inhabitants of the Asian Steppes where they mixing with those tribes which have lived there from earlier times. Thus, this branch of the White race were cutoff from communication with those who were confined to the caves and hillsides of West Asia (Europe). Those are the ones who remained for 2,000 years until Moses was sent to them to teach them civilization, which included secret teachings on how to master the Original Man. Now, the two main people, Black and White, have been cast out into the farthest Western Hemisphere along with the Indigenous Indians who are also original to fulfill their ultimate destiny. Is there a chance for America to have an extension of time as it was in the case of wicked Ninevah and the Ninevites under the sign of Jonah’s preaching of repentance? Is this not also the message of the Million Man March, the Million Family March and the Millions More Movement? Why did Master W. Fard Muhammad come to America under the sign of Jonah on the one hand and the sign of Solomon on the other? How is each prophesy to be fulfilled in the present reckoning of time? Upon the Master’s return, let us be found diligent and dutiful students of the divine word of Almighty God Allah and be found busy workers in the cause of Islam. Let us not be busy bodies of mischief making and division. All our studies, both domestically and abroad, are rooted in the study of the Divine Teachings of the Honorable Elijah Muhammad, which is the Supreme Wisdom. I am forever grateful to Almighty God Allah for the Honorable Elijah Muhammad who lives in my heart and mind, guiding me step by step in the infinite beauty and majesty of God’s way of eternal truth. I am also eternally grateful to the Divine work and magnificence of the Honorable Minister Louis Farrakhan who is guiding us on this path and journey to find freedom and happiness in the service of our people from the love of Almighty God Allah.